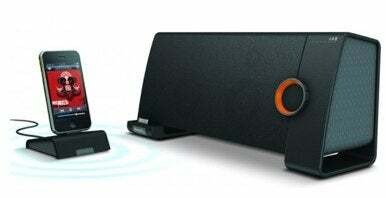 A growing number of new speaker docks for the iPhone and iPod Touch are taking advantage of those devices’ ability to wirelessly stream music via Bluetooth. The latest such dock comes from XtremeMac with its new Tango TRX. The Tango TRX boasts a 2.1 digital audio system that includes two midrange drivers, two dome tweeters, and a downward firing subwoofer. It also features LED status indicators for system feedback, a line-in jack for connecting other audio devices, and a multifunction remote control. Though you can dock your iPhone to the Tango TRX just as you would a normal speaker dock, the real fun begins when you download the free XtremeMac Tango TRX app, which lets you wirelessly broadcast your music to the Tango TRX via Bluetooth. The app provides controls for playback as well as a five-band graphic equalizer so you can fine tune your music to your liking, or select a preset according to genre. XtremeMac is offering two versions of the Tango TRX—the basic model, which sells for $180, and the $200 Apple-exclusive Tango TRX D, which adds a separate charging dock that lets you charge your device while wirelessly streaming music to the Tango TRX.